Need a wing fix? 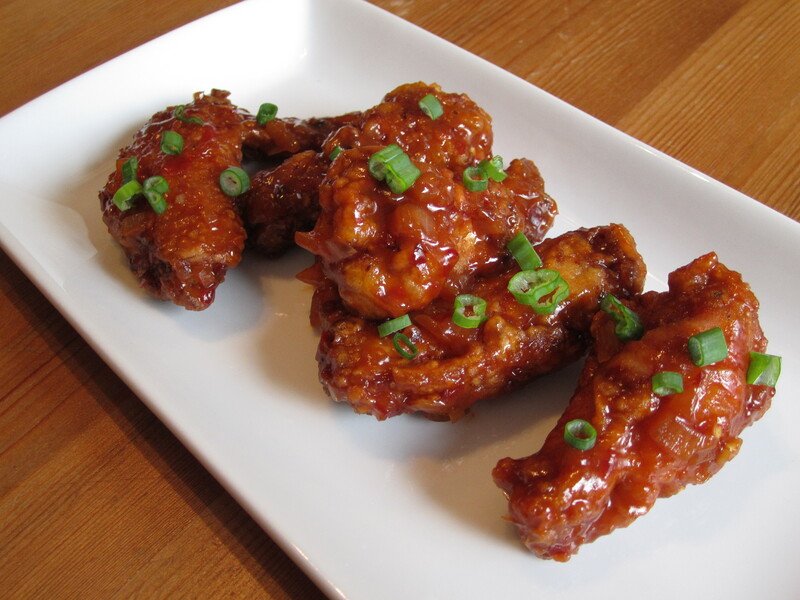 Looking for something other than traditional Buffalo Wings? These spicy babies pack sweet heat that will have you licking your fingers and asking for more. My husband, who purposely seeks out all that is fiery, couldn’t get enough of these. In a large bowl, combine the marinade ingredients, then add the chicken. Place in the refrigerator for one hour. While the chicken marinades, prepare the sauce. Heat a large saute pan over medium high heat. Add the oil and saute the onions until translucent. Add the tomato sauce, sweet chili sauce, Worcestershire sauce, water and chili flakes. Let simmer, stirring occasionally with a wooden spoon, until the sauce thickens and becomes a rich red. This will take about 20 to 25 minutes. Remove the chicken from the fridge. Drain and discard the marinade. Heat the oil in a fryer or large pot to 325 degrees. While the oil heats, coat the chicken. Combine the curry, flour and corn starch in a large bowl. Working in batches, toss the chicken wings in the mixture until well coated. Set aside on a large tray until all the wings are prepped. Fry the chicken for 3 to 4 minutes. Make sure not to crown the fryer. Work in batches, if necessary. Once all the wings have been fried, heat the fryer to 350 degrees. Fry the wings a second time for another 3 to 4 minutes until golden. Once the second frying has been completed, transfer the wings to the pan and coat them thoroughly with sauce. Serve topped with green onions. This recipe makes a lot of sauce, so you can serve the remainder on the side for dipping. Enjoy! This entry was posted in Appetizers, Chicken, Super Bowl and tagged Chicken Wings, Game Day, Korean Chicken Wings, Spicy, Super Bowl. Bookmark the permalink.